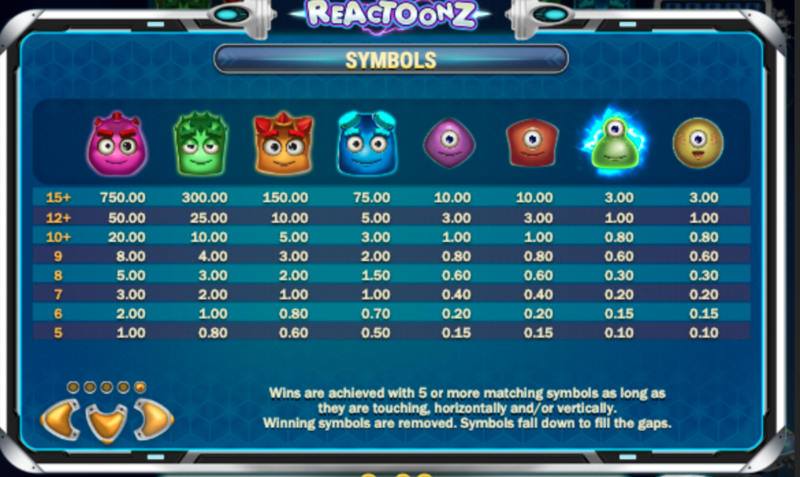 A solid cascade based game from Play’n’Go, Reactoonz takes you to an alien world and feeds up fast-paced, varied action, and high volatility with an RTP of 96.51%. Reactoonz takes you into a strange world of jelly-like monsters presided over by a serenely smiling alien creature. These adorable little critters combine onscreen to make winning combinations for you and in the process fuel the alien’s bonus powering energy orbs. It is a little difficult to work out what kind of story serves as context for this world, but it is easy to say that it is a world that is a lot of fun to look at and mess around in. The graphics are beautifully rendered and come with plenty of flavour animations for wins, bonuses and the many dials and counters which fill up over the course of gameplay. The result is a visual feast in which there is always something to look at and plenty of surprises waiting around the corners. The music like many slot machines is a bit invasive and repetitive but if you don’t like it, it is easily turned off and the rest of the sound design is a delight with all manner of sci-fi whooshes and pings. 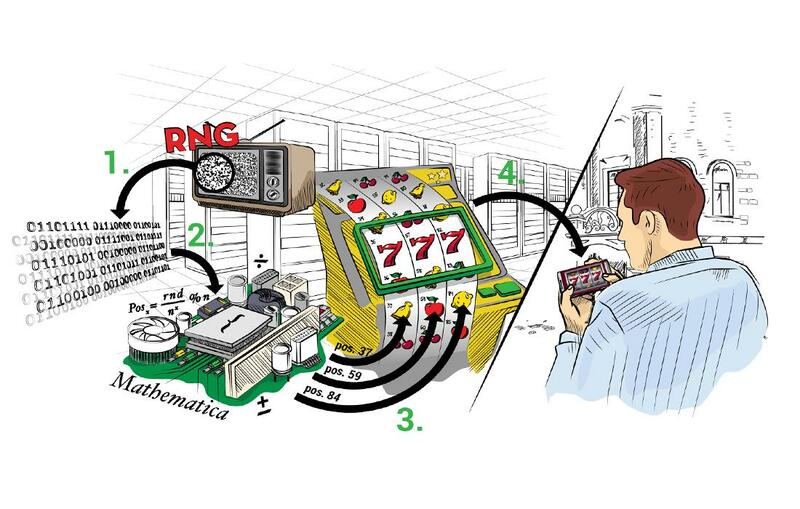 Powered by Play’n’Go software, Reactoonz is one a growing family of slot machines that are making use of the sophistication of computer software to change up the typical reel based slot machine. Here the mechanic is a cascade, where the monsters fall down as tiles onto a seven by seven grid. 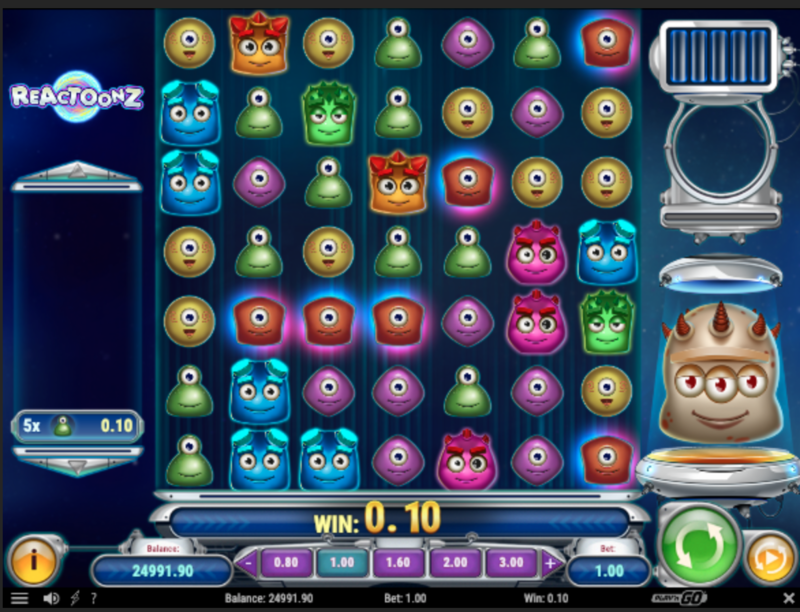 Winning combinations – which are made up of any 5 or more matching monsters that touch horizontally or vertically – are removed from the game and the tiles above them fall allowing opportunities for new combinations to form. If the new tiles trigger another win it all goes into your win for that "spin". On top of this are a series of fun bonus features which are described in full below. Overall the gameplay works well with the visuals to make for a fun, constantly changing and very flashy slot machine. There are a number of bonus outcomes. Rather than being triggered by symbols they are triggered by specific game outcomes. If you win nothing on a spin, the alien (known as Gargantoon) may drop four to eight wild symbols onto the grid. There are also a series of what are known as "Quantum Features". These result from charges which are generated when you win. If you win enough times in one spin to trigger a Quantum feature, they will trigger. There are four Quantum features which have effects ranging from destroying all the one-eyed monsters on the grid, to turning three to six symbols wild at random and destroying the adjacent symbols (see the image for full details). 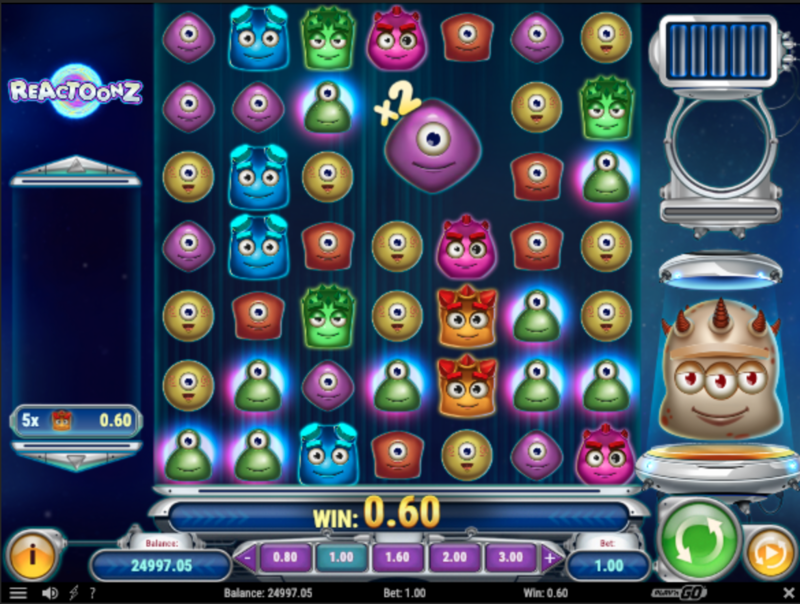 Every spin a random type one-eyed monster is selected and highlighted. If any of the highlighted monsters are part of a win, when they are removed from the grid, they leave behind two Wild symbols. Wild symbols only appear when triggered by an event. You can also win multipliers should four of the same symbol fall in a square shape. A two by two square results in a large x2 monster called a Giantoon that them occupies that space. The Giantoon counts as four symbols for the purpose of payouts. The RTP of 96.51% is more or less the industry average and so doesn’t impress but also doesn’t detract. The game is highly volatile, rarely paying out much on any given spin but with the occasional monster win. 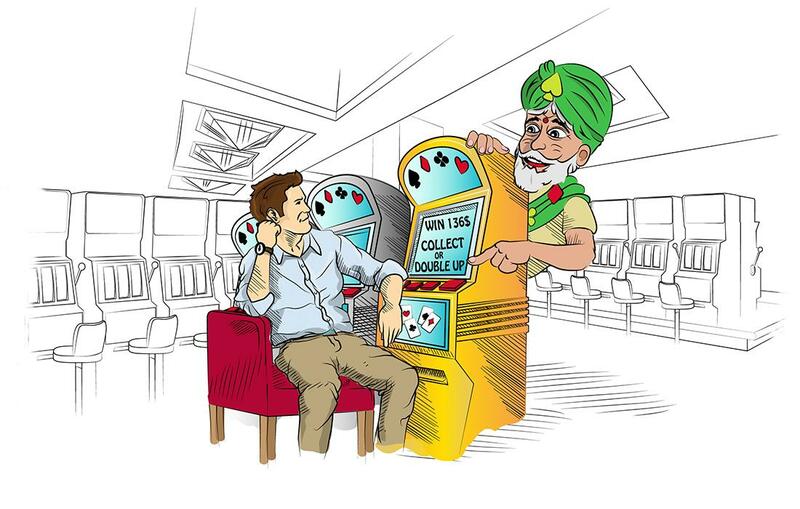 The maximum win is 4570 times your bet per spin. 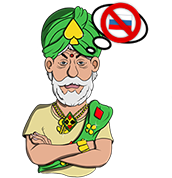 Bet sizing is done on a bet per spin system which makes calculating payouts easy but limits the amount of control you have. While this depends on the site you use, the one we tested allowed a range between £/$/€0.20 and £/$/€100.00 with a series of fixed bet sizes in-between. 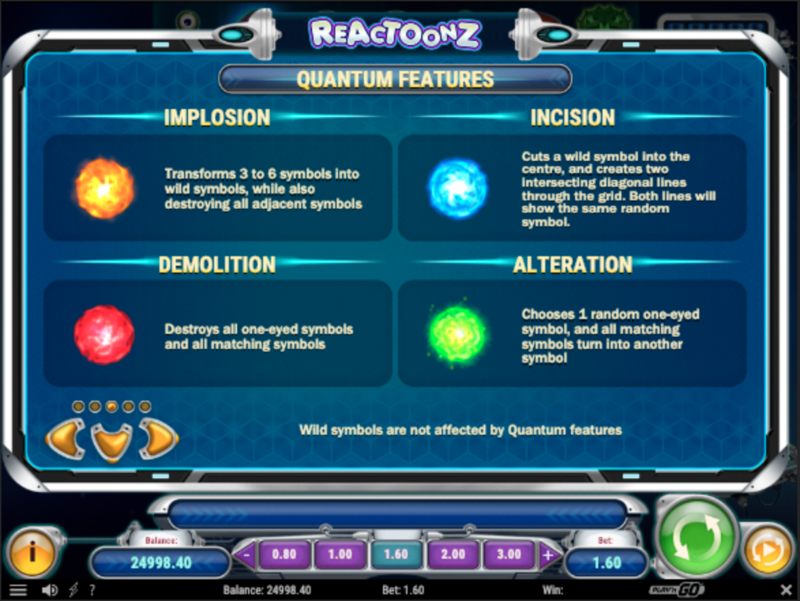 Reactoonz is a fun and stylish slot with a lot going on for those who like their games with constant action. Behind the lively animation, there are also a few nice features and as solid RTP. It is not the best game in its class, but it does a decent job of it, and seems to be doing well with players given its popularity.